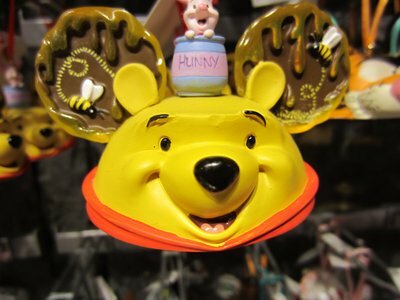 As you might expect, the Disney parks and resorts are full of small and large Disney gift shops stocked with Disney merchandise. However, there is also a surprisingly diverse range of other stores found throughout Disney World, ranging from small markets for picking up a few groceries, to exotic boutiques with luxury merchandise. All the stores at Disney World have something interesting to offer. 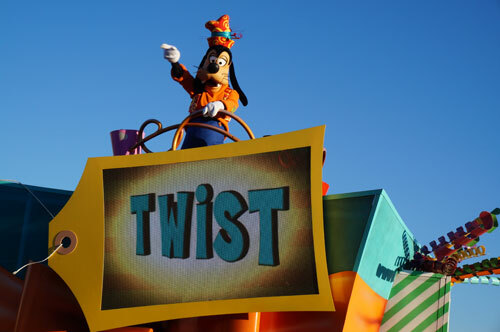 However, guests who want to maximize their shopping experience don’t need to wade through the not-so-interesting options in search of the stores at Disney World that are true gems. Here are some ideas! At Magic Kingdom, the most popular and kid friendly theme park at Disney World, there is a gift shop around practically every corner. Many of the best loved rides exit into gift shops, while those that don’t usually have a gift shop across the way to entice visitors who want a memento of their experience. 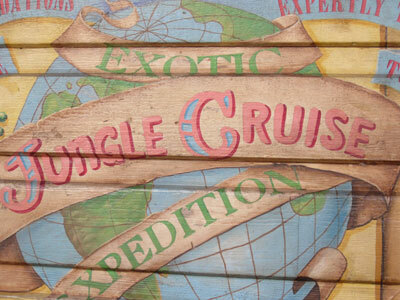 The types of items found in each of these gift shops is very similar, though they have been tailored to fit the theme of the land in which they are located as well as the ride with which they are associated. Stuffed animals, toys, t-shirts, and collectibles are the typical offerings, but while you will be able to purchase a Dopey t-shirt or plush doll at the Seven Dwarfs’ Mine, you are more likely to find jungle creatures at Adventureland‘s Island Supply. Among a sea of small gift shops, the Emporium is noteworthy for its size. This shop stretches down a full block on Main Street U.S.A. and manages to cover over 17,000 square feet. Here you will find collectible items from many modern and classic Disney films, a range of apparel, Magic Kingdom memorabilia, and much more. Even if you do not step inside, it is worth taking a little time to admire the Emporium’s impressive window displays. 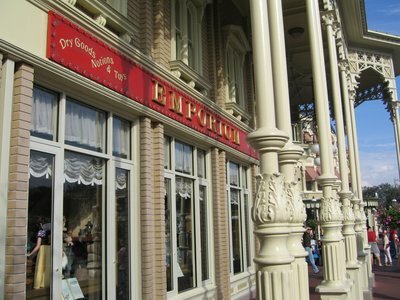 The Emporium is one of the larger stores at Disney World. Main Street U.S.A. is the entry way into Magic Kingdom, and it is also the main shopping area. Both sides of the street are lined with shops large and small selling much more than just Disney merchandise. Here you can find the Chapeau Hat Shop, Main Street Confectionary, Uptown Jewelers, or Box Office Gifts to refresh your photography supplies. 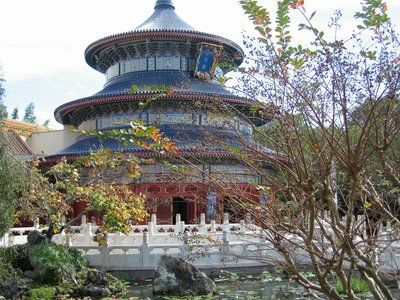 Like at Magic Kingdom, the major attractions at Epcot usually have a gift shop attached with items that celebrate a particular ride or experience. 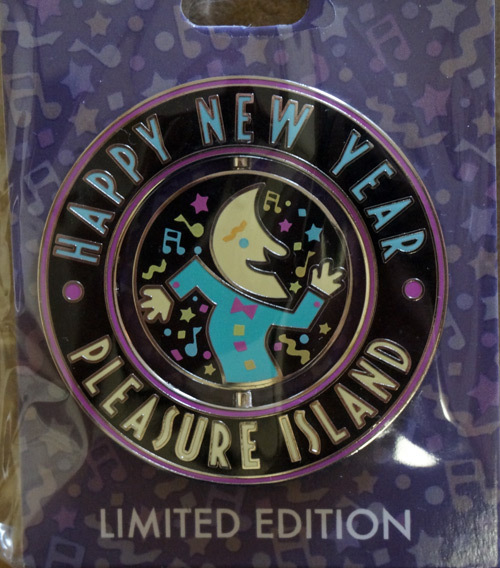 Most of these attraction gift shops can be found in Future World, and Future World is also home to a few separate gift shops such as Gateway Gifts and Disney Traders that feature Disney merchandise. Once you pass into the World Showcase, the shopping at Epcot takes on an entirely different character. Each of the World Showcase pavilions have shops full of items from their particular country, and these items run the gamut from fun to fancy. On the fun side of the spectrum, guests can visit The Art of Henna at Morocco Pavilion for a temporary Henna tattoo, or the Plaza de Los Amigos at Mexico Pavilion to pick up a sombrero. Many of the other pavilions have stores that sell flags, t-shirts, candy, and other simple items celebrating the country they represent. As a country long associated with style and elegance, it is no wonder that France is one of the best places at Epcot to shop for luxury items. Here you can shop for fragrances and cosmetics at the only Givenchy boutique to be found in the United States, or for similar items at La Signature. L’Esprit De Provence sells beautiful house ware and textile items, while Les Vins De France is the place to shop for or simply taste a range of fine French wines. Stylish women’s accessories are on sale at Plume Et Palette. 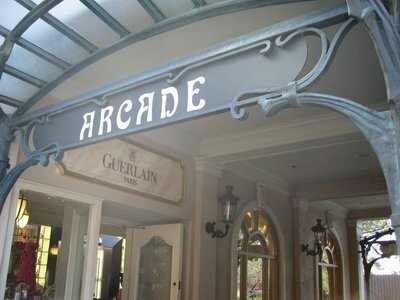 There are several upscale shops at the France pavilion. Italy is another pavilion overflowing with enticing luxury merchandise. La Bottega Italiana carries Italian wine, spice, and cookbooks. Il Bel Cristallo features expensive hand-crafted Venetian masks, jewelry, and other accessories and decorative pieces. Enoteca Castello is another place to shop for Italian wine, and also carries Italian chocolates and coffee. One of the highlights of Morocco Pavilion is the bazaar tucked away in the “Old City” area. This bazaar is full of small shops and stands with exquisite Moroccan merchandise. Casablanca Carpets sells handmade carpets, Tangier Traders sells Moroccan clothing and footwear, Souk Al Magreb is the place to buy brass souvenirs or Moroccan jewelry, while the Brass Bazaar carries bottles of rosewater, ceramics, and housewares. China Pavilion’s House of Good Fortune sells beautiful Chinese items such as tea sets, silk robes, wall prints, and porcelain. Kunstarbeit in Kristall, located in Germany Pavilion, sells German glassware and crystal jewelry. 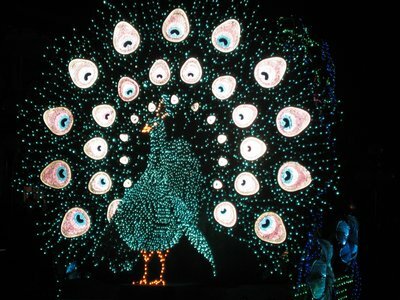 Mexico has La Princessa de Cristal selling crystal items by Arribas Brothers, and is also home to the Ring Carvers, who will create and personalize jewelry right in front of you. The United Kingdom‘s Lords and Ladies sells soaps, scarves, perfumes, and jewelry from Great Britain. Japan has an entire department store, Mitsukoshi, full of all kinds of Japanese items. 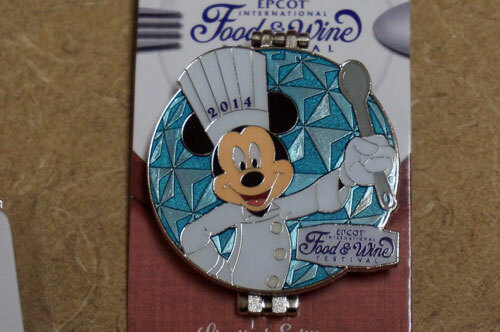 You will find plenty of interesting keepsakes at the stores in the China pavilion. Disney’s Animal Kingdom has only one noteworthy shopping establishment: Mombasa Marketplace in the Africa region of the park. This shop carries African art and other imports in addition to Disney merchandise. Each of the Disney resort hotels houses at least one gift shop, and those with multi-bedroom suites and full kitchens also have stores where guests can purchase sundries and groceries for their stay. A few also have more interesting stores that go beyond Disney souvenirs and practical items. 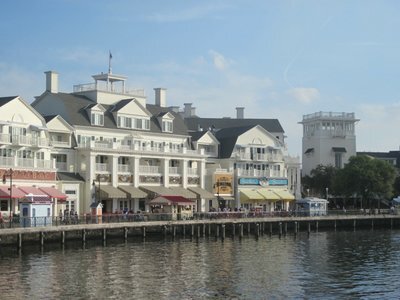 Disney’s BoardWalk in front of the BoardWalk Inn is one place to find a variety of shops. The BoardWalk Character Carnival has housewares, sporting goods, and apparel. The ESPN Club Store has sports memorabilia, while Seashore Sweets has delicious boardwalk candies. Thimbles and Threads carries beachwear, and Wyland Galleries has beautiful oceanographic art. There are plenty of interesting shops along Disney’s Boardwalk. These two distinctive hotels may not be Disney-owned, but they are definitely jewels among the lovely hotels in the Walt Disney World property. Additionally, the Swan and Dolphin resort hotes have a few upscale shopping options such as Sugar3 for gourmet candy, designer apparel at LaMont’s, and Galleria Sottil for original art and jewelry.